In Swing component bounds are defined as x,y,width,height, i.e. rectangular. Also in Swing it's very hard to trap mouse events only for a particular section of a component. Sure we can test in our mouse listener if the location of the event is in a particular section, but this isn't always good enough because the mere act of receiving a mouse event means that the parents of that component never get a crack at processing the event. (See here). This means that in Swing it is very difficult to simulate non-rectangular components. Although it looks triangular, the grip is actually a (rectangular) component layered in front of the text area. We want the user to be able to grab the grip and drag to resize, but also click in the non-grip area and interact directly with the text field. Visually its easy to split into two: make the component non-opaque and paint the corner section with some grip graphics in the paintComponent method - letting the parent show through in the unpainted corner. 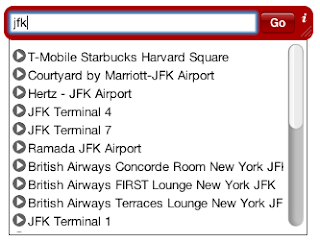 However event-wise there's no API to split a component into responsive and non-responsive areas. It would be nice for example if JComponent.processMouseEvent call returned a boolean indicating if the event was actually processed. It doesn't, so we have to hack in a fix. 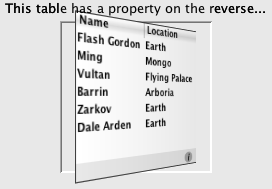 Luckily Component.getCursor() is continually polled as the mouse cursor moves over a component. Overriding this we can detect where the mouse location is over our grip area and act accordingly. If it's over the visible grip area we can add a mouse listener and start receiving events, if it's over the transparent area we remove the listener and the events are automatically routed to the parent. Of course you can make the location test as complex as you like creating components of any shape. 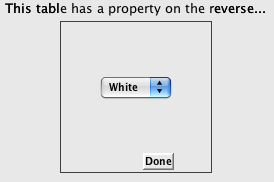 Well, the animation will have to wait, but the button is easy to knock up in Swing. - The button will extend AbstractButton and draw it's own close icon of a white cross inside a black disc. 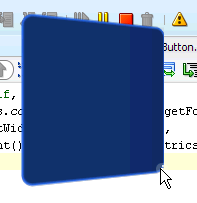 - The button will listen for mouse clicks inside the disc area, and call System.exit(0) to close the widget. - Add input/action entries on the widget frame to respond to the alt key and call button.setVisible(true/false). Widgets have nice rounded borders. The LineBorder in the JDK doesn't really cut it: It's not anti-aliased, it draws weird artifacts, and it's tough to have the outside of the border transparent while inside the border is opaque. 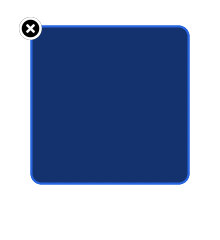 As this border does the job of filling the entire background of the component with the component's background color, we can make the actual component transparent and this will leave nice transparent areas outside the curves of the corners. 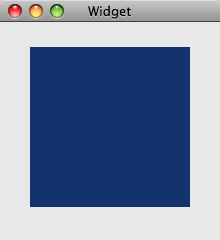 (Opaque components fill their entire bounds with the background color). 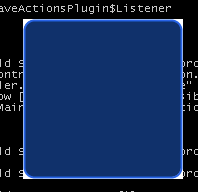 The drawback of this is that the border is painted after the component's contents, so custom painting for the widget content must be done in the paint method rather than the paintComponent or it won't show up. Java 6 u10 will allow transparent windows and undockable applets. This should allow the creation of some Dashboard widget like Swing apps. I'll see how close I can get to creating a basic widget in Swing. I'll take it one step at the time and post all the code and a demo at the end. The exercise is purely a UI one. 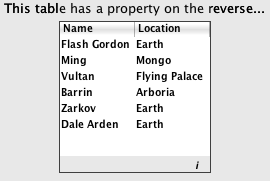 The code marvelousness and resource usage won't be a top concern here. In this case a blue square that does nothing. In the next few steps I'll try and get it more widget like. 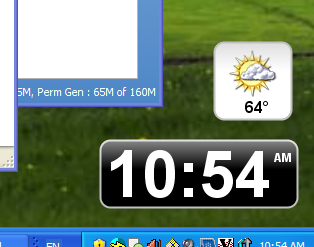 One of the nice things about Dashboard widgets is that their preferences are presented on the reverse of each widget. Doing this means that preferences don't take any extra screen real estate, they don't need a dedicated preferences dialog, and a nice flipping animation gives users a natural sense of their location. 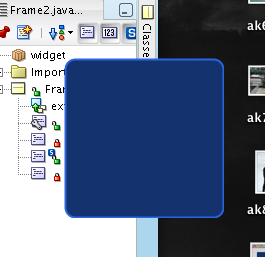 The front and back components are placed on top of each other in a JLayeredPane, the back one is initially hidden with setVisible(false). 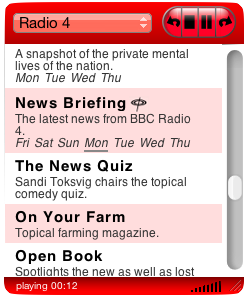 Pressing the 'i' button starts the transition to the back. The transition animation technique is pretty much the same as my animated tree (why does JRoller delete hosted images after a while??). An image of each of the front and back components is captured, then temporary 'tween' images are composited and displayed in a layer above the real components during the animation. The animation uses a perspective transform from JHLabs to gradually spin the front image away and the back image in. A semi transparent gradient is also drawn over the top to darken the end of the image spinning 'away' from the user giving a better sense of depth. 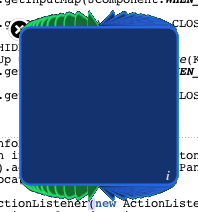 Once the animation is complete, the front component is hidden, the back one made visible and the 'tween' image overlay is removed. Voila! A spinning JComponent.